UIUIX 2 in 1 Travel Dog Water Bottle is Ready For Any Adventure! -Want to feed your four pawed companion on the go conveniently? -Want to feed your dear pet with safe water and food outdoors? -Need a travel dog mug that can simultaneously hold water and food? Just Take Our Portable Dog Water Bottle with Bowls and Leave Us Your Concerns! Uiuix dog water bottle contains two watertight chambers, one for fresh water another for crunchy snack when you are both on the go. Sealed Design can keep food dry and water fresh. Watertight anytime; leak-proof anywhere. Included TWO collapsible pet cups, your pet could have water in one and food in the other, you don't need to buy an extra bowl. We use only safe material, the dog water bottle is made of BPA-free PP, the foldable bowl is made of food grade silicone. Safe and healthy for your pet. Portable size. With carry handle. Ready for any adventure, from short-walk to long-time traveling. 2. Don't put these in the cup: dry ice, soda water, etc. 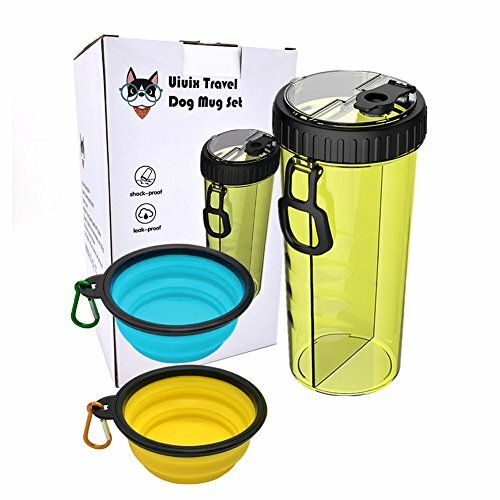 ★2-in-1 & Large Capacity: Uiuix dog water bottle contains two watertight chambers, one for 17oz(500ml) fresh water another for 7oz(200g) crunchy snack when you are both on the go. ★Two Collapsible Dog Bowl: Included TWO collapsible pet cups, your pet could have water in one and food in the other, you don't need to buy an extra bowl. Each bowl is 12oz. ★Leak-proof Design: One compartment holds water with a watertight cap top, the other compartment holds kibble or snacks. It design to keep food dry and water fresh. ★Easy to Carry & Clean: Portable size and carry handle makes it easy to bring, perfect for outdoor walking, hiking, training, running, camping etc. Simple structure is very easy to clean too. ★Material: We use only food grade, BPA-free PP materials, Perfect choice for your pets. Every purchase comes with an extended 2 months replacement guarantee and friendly customer service provided by UIUIX. If you have any questions about this product by Uiuix, contact us by completing and submitting the form below. If you are looking for a specif part number, please include it with your message.